- Look closely! Hidden in the heart of these Celtic moon earrings is a tiny star, skillfully blended into the surrounding knotwork. These crescent moon stud earrings are simply irresistible. They are crafted of sterling silver, to mimic the Moon's lustrous glow. You'll find yourself reaching for them every day. How often do we set our dreams aside because in the harsh light of day they seem fanciful and unrealistic. Let these Silver Celtic Crescent Stud Earrings remind you to follow your intuition. There is light to be found on even the darkest night. With the moon and stars to illuminate your path, how can you go wrong? 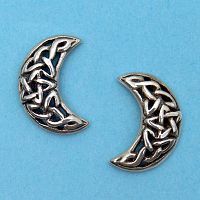 These Celtic crescent earrings measure 3/8" tall. For pierced ears only. What are the posts made of? I'm sensitive to some metals. 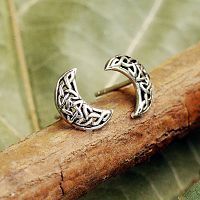 The Celtic Crescent Stud Earrings are made entirely of sterling silver, posts included. Most people do not react to sterling, but always let your own experience guide you if you have had problems with silver in the past. Who is the Celtic moon goddess? Strangely, there is no one single deity in Celtic mythology that fills the role of moon goddess. Arianrhod is one that is strongly associated with the moon and stars. Her name means "silver-wheel". Epona, the horse goddess, is another one with strong ties to the moon. Legends say that she rides a white horse across the night sky, galloping westward to avoid the rays of the rising sun. Do you have any other questions about our Silver Celtic Crescent Stud Earrings?